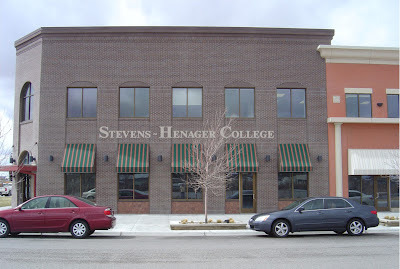 Stevens-Henager College's campus at Snake River Landing in Idaho Falls. Stevens-Henager College will be having a ribbon cutting and grand opening May 24 at its Idaho Falls campus, at Snake River Landing. The ribbon cutting by the Greater Idaho Falls Chamber of Commerce Ambassadors will be at 11:30 a.m. An open house and lunch, catered by Buffalo Wild Wings and Mi Amor Catering, will follow, lasting until 1:30 p.m.
Stevens-Henager goes all the way back to 1891, when it was founded in Ogden, Utah, as Intermountain Business College by James Ayers Smith, an educator from Nebraska who wanted to teach commercial subjects and place graduates in business positions. It changed owners and names several time, becoming Smithsonian Business School in 1910; Moench University of Business in 1938; and Ogden Business College in 1940. It became Stevens-Henager in 1959 and established its first branch campus in Provo in 1978. In addition to Provo and Idaho Falls, it now has branch campuses in Murray and Logan, Utah, and Boise.